Preventative maintenance is now accepted as being an essential part of facilities management. If carried out in a structured and organized manner it can save considerable cost and downtime due to equipment failure. AML Switchgear strongly believe that regular switchboard maintenance is an essential part of preventative maintenance for industry and business today. A major part of successful preventative maintenance is getting accurate data with a minimum amount of interference and disruption to your facilities. Until recently, it has been standard practice to arrange scheduled shut downs of main switchboards and plant to inspect the boards and their respective componentary, while in a de- energized state in order to manually check electrical connections for tightness and identify signs of deterioration. Although this was an effective method to identify obvious potential problems, this is not a full proof method of ensuring all equipment was operating correctly. Apart from the obvious downtime and lengthy costs associated with having a technician on site for hours, sometimes days on an annual basis, there are other risks involved with conducting switchboard maintenance in such a manner like continued and repetitive tightening of terminals and studs leading to failure through over tightening. In addition, the simple visual inspection and terminal check method, traditionally carried out, does not always identify other important factors, such as equipment overloading or imbalance scenarios. Traditionally, the only way of identifying such potential issues during a total maintenance shut down has been through obvious evidence of overheating through burnt terminals and wiring etc. If no visible signs of such were evident, the potential fault could go unnoticed resulting in failure in the future when the equipment was again in service. One solution to these issues is to conduct regular thermal imaging of switchboards and equipment. In recognition of providing an added value service to our customers, AML Switchgear has now invested in thermal imaging equipment and training which we can now offer to our clients. 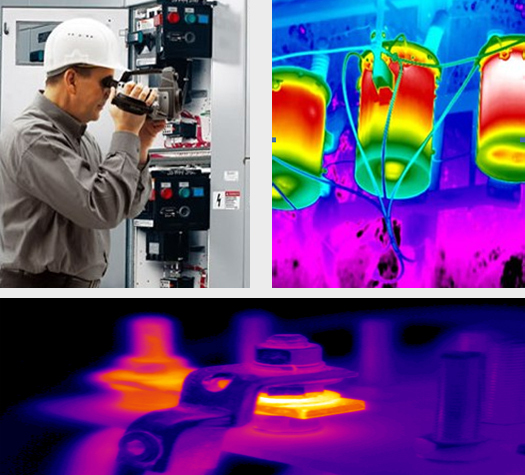 By detecting potential equipment failure areas with an infrared camera, you can prevent most unscheduled equipment shutdowns and identify potential electrical problems that could lead to higher maintenance bills and possibly devastating electrical fires. impacts of emerging potential component problems. By working with your maintenance staff and personnel, key critical equipment will be identified. An equipment list will then be established. Infrared and static visual pictures will be taken of the equipment while under normal electrical load. At the conclusion of the tests, the resulting images will be put into report format allowing for easy analysis. The report is delivered to you for follow up investigation and/ or repair at a scheduled time. Below is an example of what is included in our report for a specific piece of equipment. In this example, excessive Heat has been detected on the outgoing Fused Switch. The Fused Switch knife contacts have possibly lost their spring tension resulting in a high resistance joint. This type of fault should be remedied as soon as possible to ensure it does not fail in service. AML Switchgear charges for this service are based on a half day or full day equipment charge (depending on scope of thermal imaging service required) plus an hourly rate for our technician to conduct the thermal survey. At the conclusion, any immediate threats will be advised and AML will then prepare their report for submission within 2 working days from survey conclusion. AML believe that by offering this service this will provide added value to your current maintenance regime and minimize the amount of reactive calls you will have to attend and of course save you valuable time and money due to undetected equipment failures. Prior to conducting any thermal imaging survey AML staff will meet with you to discuss your specific installation and work with you or your maintenance staff to formulate the best strategy based on your requirements. At this stage we will also agree on a budget price to conduct this survey.